The arugula under the covers is fleshing out nicely. The remay covers are lightweight fabric which keeps the tunnels warmer, drier and bug-free. 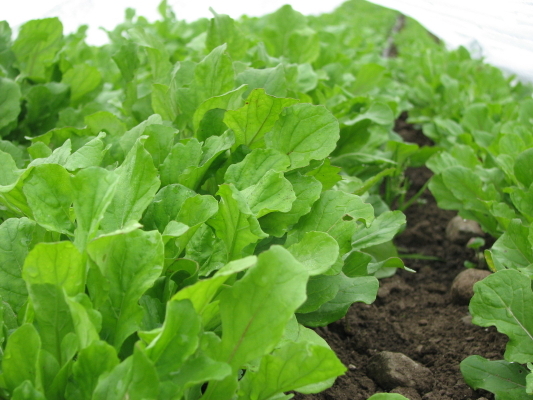 We have been taking arugula to market that is going to flower, for the past few weeks. It is quite spicy and stemmy. Chopping it like cilantro or basil, as one would any herb, is a strategy I adopt when it gets like that. I’ve even made an arugula “pesto” which is delicious. This succulent new arugula will be at Friday’s farmers’ market. This entry was posted on Tuesday, March 15th, 2011 at 5:59 pm	and tagged with arugula, remay covers and posted in Uncategorized. You can follow any responses to this entry through the RSS 2.0 feed. Arugula pesto? Yum! Would you simply substitute arugula for the basil, or would you adjust other ingredients, as well? I adore arugula, even when it’s stemmy. Yes, simply substitute is what I’ve done. I have also changed up with the nuts… sometimes (usually) using walnuts instead of pine nuts. They’re local. It is definitely worth a try.